In response to the growing volume and varying quality of data involved in forensic investigations, we are proud to announce our partnership with Griffeye, the world’s premier intelligence and visual big data platform, to address some of the biggest challenges facing forensic communities today. The partnership will ensure Amped users can swiftly perform higher volumes of image identification and analysis to more efficiently investigate evidence. Gothenburg, Sweden, 6 December 2016 – In response to the growing volume and varying quality of data involved in forensic investigations, Griffeye, the world’s premier intelligence and visual big data platform, has partnered with Amped Software, the leading provider of forensic image and video analysis solutions to address some of the biggest challenges facing forensic communities today. The partnership will ensure users can swiftly perform higher volumes of image identification and analysis to more efficiently investigate evidence. “As data grows exponentially, the complexity of the data also evolves at the same pace. It has become critical for law enforcers and forensics teams to move faster than ever before without missing out on pertinent leads. This has left customers crying out for integrated tools that can speed up proceedings, while staying focused” said Johann Hofmann, Head of Griffeye. Griffeye’s Analyze DI and Analyze CS can be used to handle large volumes of images and videos, filter irrelevant digital files, prioritise, correlate and identify the most pertinent material in investigations. Amped FIVE, Amped Authenticate and Amped DVRConv enable in-depth analysis of images and videos, convert unplayable videos to standard formats, detect tampering of material, and enhance quality of video files to provide an overview of any content requiring further analysis. Using an open API, images and videos can now be passed between Griffeye and Amped, removing the labour intensive process of bringing evidence separately into each application. Griffeye provides the world’s premier intelligence and visual big data platform for digital media investigations handling images and video. Griffeye Analyze DI, CS operations and CS enterprise can be used in any investigation containing digital material for industries including law enforcement, defense, and national security. Griffeye was initially part of NetClean, with a focus on child sexual abuse (CSA) investigations. In 2015 it became a separate brand from and peer company to NetClean and a subsidiary to Safer Society Group. For more information, visit: www.griffeye.com. 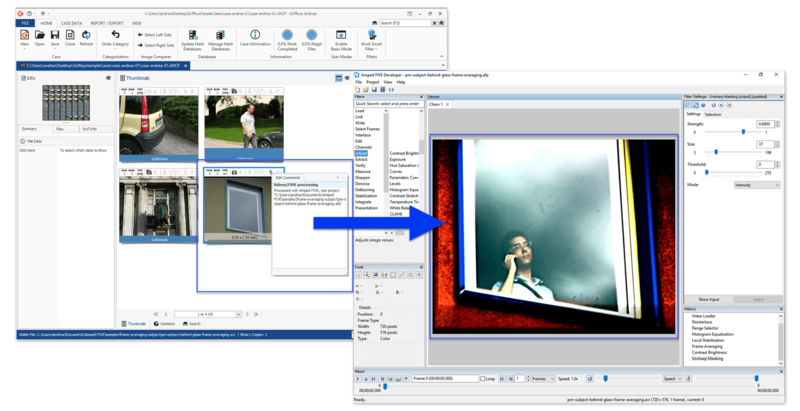 Amped Software develops technologies for the analysis, enhancement and authentication of images and video for forensic, security and investigative applications. Amped Software products are used by law enforcement, government agencies, forensic labs and security companies worldwide. Founded in 2008 in Trieste, Italy, Amped Software’s single mission is to create the one-stop software for any image and video processing need related to security and investigations. For more information, visit: www.ampedsoftware.com. This entry was posted in Announcements, Press / Media on December 6, 2016 by Darlene Alvar.